It has been a while since I have absolutely loved a recipe. We cook a lot in our house and I “like” a lot of the recipes but I always find myself finding a small fault where I wish it was easier, or was healthier. To my surprise, while just making a regular Sunday dinner, I found a recipe I want to share with everyone. Typically I would only make a recipe rated 5 stars on foodnetwork.com since there are thousands of choices and why make one that rates any less than the best. This recipe though was rated only 4 stars and I am shocked. 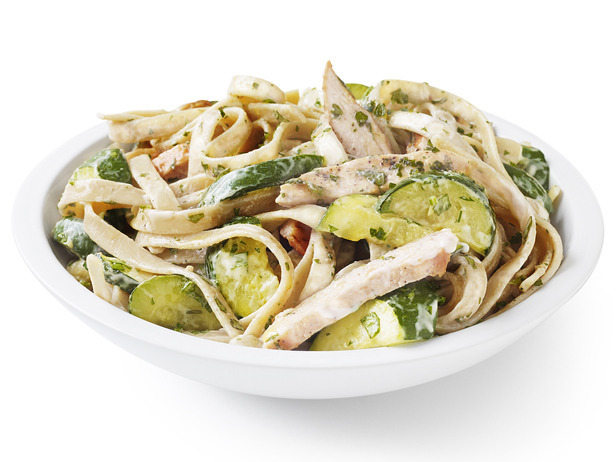 It is a receipe for chicken-zucchini alfredo. My child literally ate 5 dishes of this and my husband and I are fighting over who will bring the leftovers for lunch. Now it is a “lower” fat version of alfredo which I really like and contains NO cream.However, it is not a low-fat recipe with 600 calories per serving. Most of the calories comes from the oil and the cheese so use sparingly to make that number come down. Also, you don’t need as much evaporated milk so you can decrease calories there. All in all – your children will eat vegetables, whole wheat, and protein in a wonderfully delicious, easy to make meal. I’m a fan. I hope you are too.